Are you running out of time to find unique gifts and stocking stuffers for all the special people on your list? Cracker Barrel Old Country Store(R) offers a collection of gifts suited for practically anyone and any budget. Guests can select from an assortment of cozy fleece sweatshirts for ladies, garage-themed goodies for men, and plush animals and remote control toys for the kids. There’s even an entire section of gifts for less than $10, which includes model planes, novelty tees, jewelry, and plenty of good old-fashioned treats to stuff those stockings. “Our guests expect shopping that’s unique and surprisingly fun, so we make sure they can find gifts that will delight their families and friends,” said Laura Daily, Senior Vice President of Retail, for Cracker Barrel. Cracker Barrel(R) offers take-home packages of popular foods served in the restaurant, such as pancake and corn muffin mixes, coffee and jars of various jams and fruits. Guests can select their favorite food items to be included in custom gift baskets. 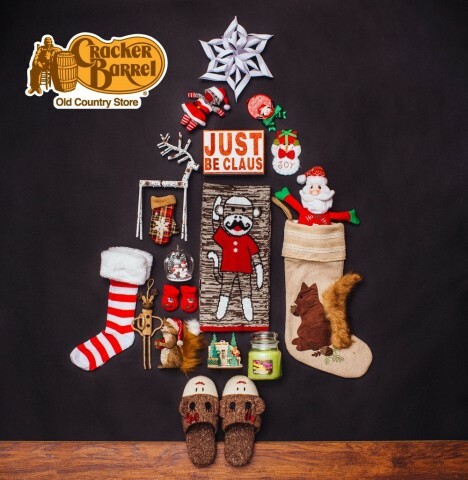 In addition, Cracker Barrel has complimentary gift-wrapping and the retail staff will provide shoppers with personal assistance in selecting just the right gift for family and friends. For guests who want the convenience of shopping online, Cracker Barrel’s e-commerce site offers popular classics. It’s organized with product photos and easy navigation to help shoppers find a wide range of items from furniture to food, apparel, games, music and seasonal selections. Visit crackerbarrel.com for details and to find those last minute gifts. Cracker Barrel Old Country Store, Inc. provides a friendly home-away-from-home in its old country stores and restaurants. Guests are cared for like family while relaxing and enjoying real home-style food and shopping that’s surprisingly unique, genuinely fun and reminiscent of America’s country heritage…all at a fair price. Cracker Barrel Old Country Store, Inc. (NASDAQ:CBRL) was established in 1969 in Lebanon, Tennessee and operates 634 company-owned locations in 42 states. For more information, visit crackerbarrel.com.